People started freaking out on Wednesday afternoon when a giant inflatable chicken resembling Donald Trump appeared outside the White House. A local Fox affiliate even covered the event live. What the heck is happening? It wasn’t immediately clear how the sassy balloon ended up near some of the most highly protected air space in the country. It was, however, immediately clear that some people might want a Trump chicken of their own. And eBay’s got the answer. 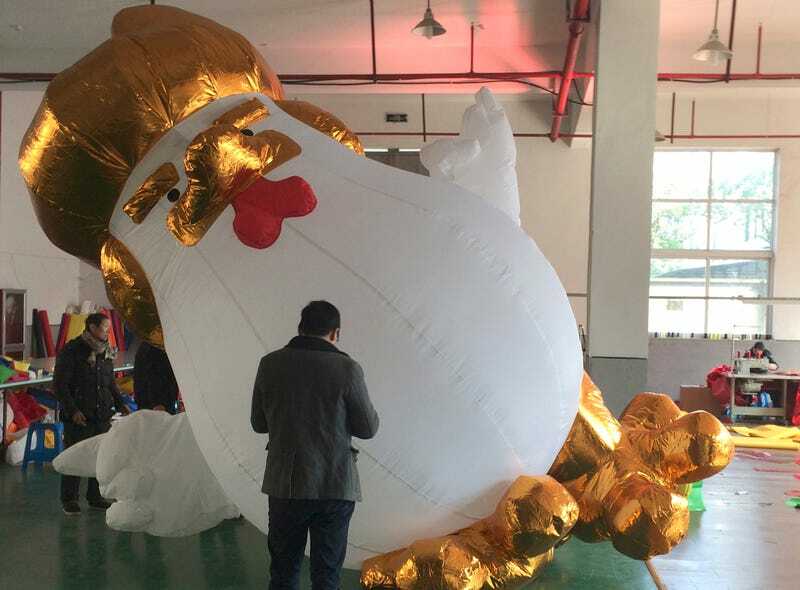 For just $500, you can purchase a 10-foot-tall, inflatable “Donald trump chicken mascot golden hair” from an eBay seller in Hong Kong. The listing title specifies that this item is “custom made,” made of “oxford fabric,” and comes with free shipping. That’s not bad for any extremely large object with historical significance. Quite frankly, it’s a better deal than the eight-foot-tall inflatable UFO offered by the same Chinese seller. There is, of course, a back story to this specific icon. The original Trump chicken was a 23-foot-tall rooster sculpture that appeared last November outside of a mall in Taiyuan, China. While The New York Times reports that the sculpture was erected “to celebrate the coming Year of the Rooster in the Chinese lunar calendar,” the resemblance to Trump is unmistakable, and knockoffs quickly appeared online. You can now buy Trump chicken shirts, mugs, and replicas of the original sculpture. Now it’s August and Trump still hasn’t released his tax returns. There is some anxiety from the Trump camp that Robert Mueller’s investigation into the Trump campaign and Russia could reveal damning details about the president’s finances, though we’ll have to wait and see if that’s actually true. We’ll also have to wait and see where the Trump chicken will show up next. Politico reports that Donald Trump will stay in Trump Tower for three nights next week during his working vacation. And we already know that some of the Tax March NYC protesters have Trump chicken merchandise. Will they bust out the big balloon for the big president’s latest big homecoming? We’ll see.